Any business owner operating a fleet of vehicles in their day to day operations understands why it's so important to treat company trucks and automobiles as potential moving liabilities. 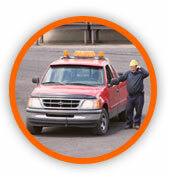 With the help of a fleet traffic school safety course, owners can minimize the amount of costly accidents that occur, thus minimizing potential financial loss, painful lawsuits, rises in insurance premiums, and avoid any loss of employee work days. You can't always control road hazards and road conditions, but you can help teach safe driving skills by offering safety training to your entire behind the wheel workforce. Why a Florida Fleet Traffic School Course is Right for You? Access the online course real-time from anywhere because web based training remains available across multiple locations, at any hour, in any time zone. Put Your Trust in the Best! FloridaSpeedingTicket.com's fleet safety programs are powered by the leader in keeping trucks, vans, and company vehicles safely on the road: TrafficSchool.com. When you register with FloridaSpeedingTicket.com, not only do you get online ready fleet traffic school at a great promotional group price, you get the TrafficSchool.com guarantee - your fleet's full satisfaction or get your money back!